The OSI model consists of seven protocol layers and each layer performs a supportive communication task. The Transport layer is the fourth layer in the OSI model, which provides communication services between the computers connected in the network. For example: The transport layer provides an error checking service during the transmission of data packets from source computer to destination computer. Software at the transport layer is responsible for establishing temporary communication sessions between two application programs, and delivering data as requested by those applications. (When you make a phone call, a temporary session is established between you and the person you are calling). The transport layer receives data from the application, and breaks it into chunks called segments, and sends them to the network router for delivery. Two transport layer protocols are used on the Internet. The transmission control protocol (TCP) is used for applications in which reliable connections between hosts are necessary. TCP checks for transmission errors, lost packets, packets out of order, etc, and tries to automatically correct these without “bothering” the application program. It also does flow control, slowing transmission if it is too fast for the receiver. The user datagram protocol (UDP), is an unreliable transport protocol with no sessions or flow control and optional error checking. UDP just sends packets as soon as requested and forgets about them. It is faster than TCP, and is suitable for isochronous applications like voice over IP (VOIP) or streaming video where error correction is pointless. The first three layers of the OSI Reference Model—the physical layer, data link layer and network layer—are very important layers for understanding how networks function. The physical layer moves bits over wires; the data link layer moves frames on a network; the network layer moves datagrams on an internetwork. Taken as a whole, they are the parts of a protocol stack that are responsible for the actual “nuts and bolts” of getting data from one place to another. Immediately above these we have the fourth layer of the OSI Reference Model: the transport layer, called the host-to-host transport layer in the TCP/IP model. This layer is interesting in that it resides in the very architectural center of the model. Accordingly, it represents an important transition point between the hardware-associated layers below it that do the “grunt work”, and the layers above that are more software-oriented and abstract. Protocols running at the transport layer are charged with providing several important services to enable software applications in higher layers to work over an internetwork. They are typically responsible for allowing connections to be established and maintained between software services on possibly distant machines. Perhaps most importantly, they serve as the bridge between the needs of many higher-layer applications to send data in a reliable way without needing to worry about error correction, lost data or flow management, and network-layer protocols, which are often unreliable and unacknowledged. Transport layer protocols are often very tightly-tied to the network layer protocols directly below them, and designed specifically to take care of functions that they do not deal with. In this section I describe transport layer protocols and related technologies used in the TCP/IP protocol There are two main protocols at this layer; the Transmission Control Protocol (TCP) and the User Datagram Protocol (UDP). I also discuss how transport-layer addressing is done in TCP/IP in the form of ports and sockets. The data link layer helps to deliver the frames between two neighboring nodes over a link. This process is called as node-to-node delivery. The network layer helps to deliver the datagrams between two hosts. This process is called as host-to-host delivery. Several processes are carried out on the source host and destination host. 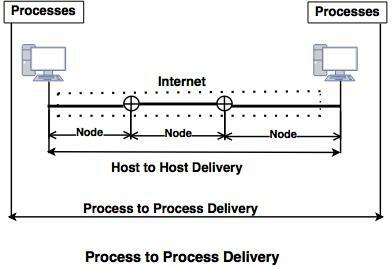 Some mechanism is needed to complete the delivery process between the source host and destination host. The transport layer helps to carry out the process-to-process delivery i.e. the delivery of a packet or part of message from one process to another process.